First things first, it’s good to know that your anchor text selection on your site is one of the most vital skills that you can do in terms of off-site SEO techniques. 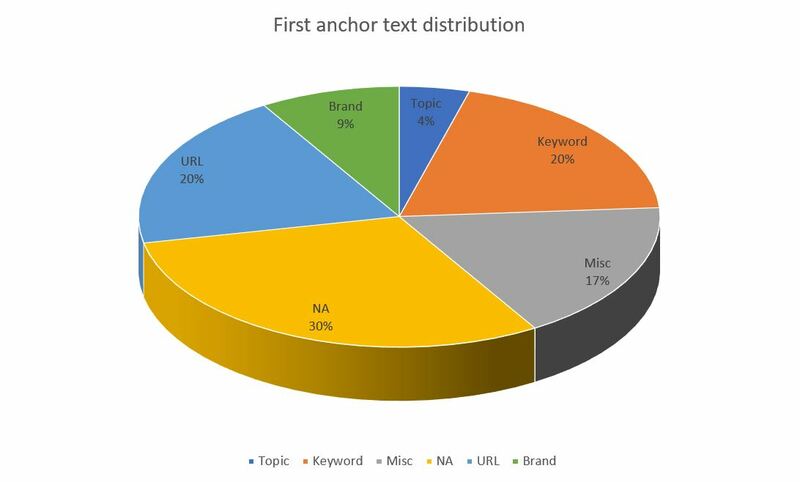 Obtaining the right anchor text distribution can break or make you in the search results. This guide will ensure you’ll be doing it the right way and not welcoming yourself to a Google penalty. How do I know what anchor text I should use? Unfortunately, this is not a straight forward answer as it is different depending on the business and niche you are targeting. It does take time, analysis and practice to find the anchor text distribution that’s right for you. The beginning process to understand and establish what you anchor text selection should be is to analyse what your competitors in the same niche are doing with their anchor text distribution. 25% topic anchors, these anchors are vague and are a specific niche for example “digital marketing” and “web design”. 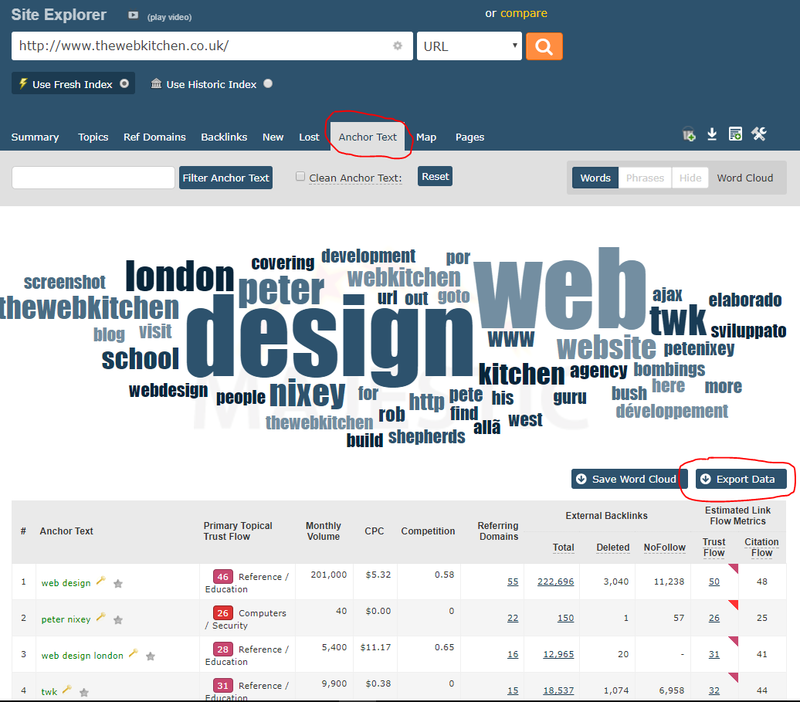 10% longtail and keyword anchors, for example, “search engine optimisation”, “what is SEO”, “SEO service”. 15% miscellaneous anchors, for example, “read more”, “go to website”, “click here”, etc. Whilst many people concern themselves with keeping their ratio of categories of anchors as close to this distribution as possible, in some cases it doesn’t work at all. Protip: Go to Google, search for your target keyword and chuck the findings into a backlink checker such as Ahrefs or Majestic. Here is where you can compare with your competitors to find the anchor text ratio that Google is wanting. It’s normal to find that your company’s website will not have this perfect and natural anchor text distribution. 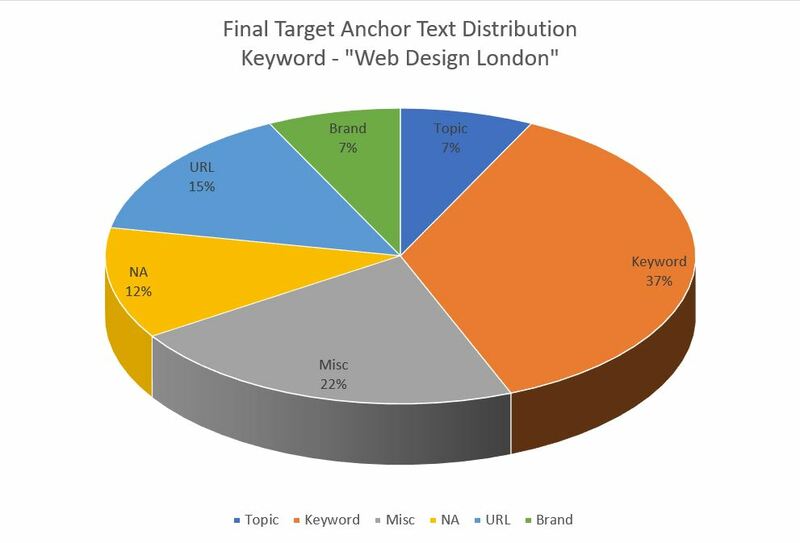 For example, this is an anchor text distribution for a website that came under the first result for ‘web design london’. To find out the target distribution of your anchors for your specific niche, follow these steps. 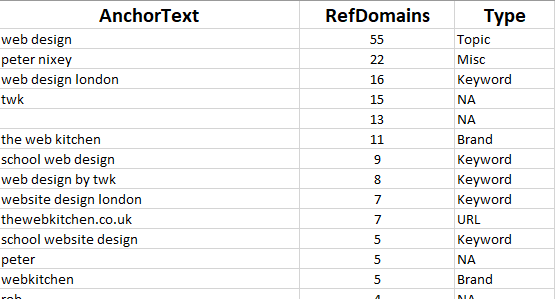 Export the data into an excel document and categorize all of the anchors by type as listed above. I use the top 50 anchor text so it doesn’t take too much time. Now you can work out the anchor text distribution for this website by counting up how many anchor texts there is for each type and then generating a pie chart. You now have an accurate depiction of what Google is specifically looking for in terms of anchor text distribution. Now it’s time to commence your link building campaign whilst following this anchor text distribution, the only alteration is that you will be achieving this in a much more superior manner than the competition. Thanks for reading, if this post brought to you some valuable insight do let us know your thoughts on our Twitter or Facebook!